We at Sheepgate are becoming increasingly aware of the problems encountered by our visitors in driving through Boston. 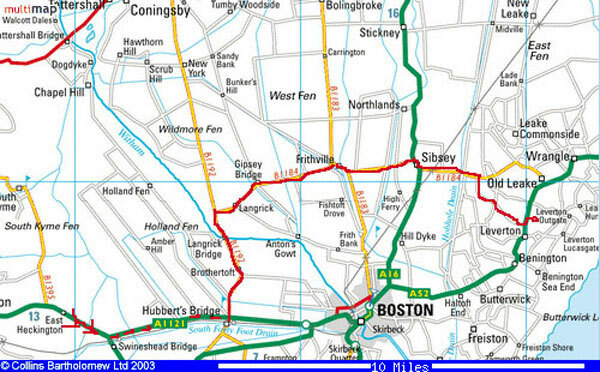 The attached map shows an alternative route (in red), avoiding Boston when travelling from the NORTH. Having turned off the A17 at Swineshead Bridge onto the A1121, as normal, in the 40mph zone at Hubberts Bridge turn left onto B1192 towards Langrick. After traffic Lights over the river Witham at Langrick Bridge and 1/2 a mile turn right onto B1184 towards Frithville. At Gipsey Bridge and after sharp right bend, turn left to continue on B1184. Upon reaching Frithville go over the Drain turn right towards Sibsey. After 1/4 a mile slip left towards Sibsey on B1184. When you join the A16 in Sibsey turn right and then left after 1/4 a mile towards Old Leake. Proceed over railway crossing to T junction, turn right and then left after 100yds. Take first right to Leverton. Go to the end of this road to join A52 in Leverton. Turn left and then right after 200yds into Sheepgate. This route adds approximately 4 miles to your journey, but will save you time! This route can be used when travelling from the SOUTH, but adds approximately 12 miles to the journey. When travelling on the A17 or A16, upon reaching the roundabout at Algakirk, proceed on the A17 towards Swineshead. Before Swineshead turn right onto the A52. At Kirton Holme turn left onto the B1192 to Hubberts Bridge. Straight over at T junction at Hubberts Bridge, and you are now on the route above.